I have an Idea! let’s all bully the hell out of an artist so that he will do whatever we believe in, regardless of his own opinion! I honestly believe that this is what goes through BDS followers’ minds when they go on an “operation stop a random artist from performing in Israel”. Once again artists who are scheduled to perform in Israel are going through a virtual brutal and unrestrained attack which is basically just like holding a gun to their head forcing them to follow a belief who’s not theirs. This time, Alanis Morissette is the victim. Morissette, a very loved artist in Israel since 1990’s, is due to play in Tel Aviv on December 3rd, and the show has been sold out for weeks now. 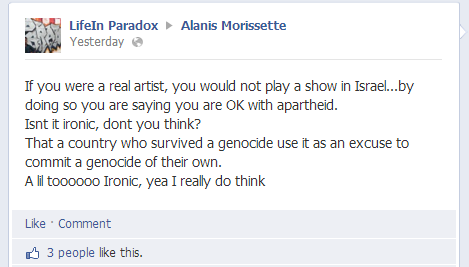 Apparently Morissette isn’t a REAL artist. you are welcomed here in Israel. By deciding to perform you will join artists like Madonna, Red Hot Chili Peppers, Guns and roses, Cirque du Soleil and many others who chose to stay loyal to their fans in face of threats. Who separate arts from politics and truth from popular lies and misconceptions. Who truly believe in peace. yep, they were always bad, they are just getting worse. there will always be sick, misguided people, and evil people as well. sad but true. our job is to not give into them and not let them have their way, even if we need to use strength to protect ourselves and others. I can just about guarantee these people who are harrassing her are following those lies without doing researching to find out if those lies are true. How pathetic pop culture is. The blind leading the blind. Don’t believe everything you hear but research it. Find out for yourselves if it’s true. Let no one deceive you with empty words. Alanis should publish a list of all these tweeters and let us share our opinions with them. 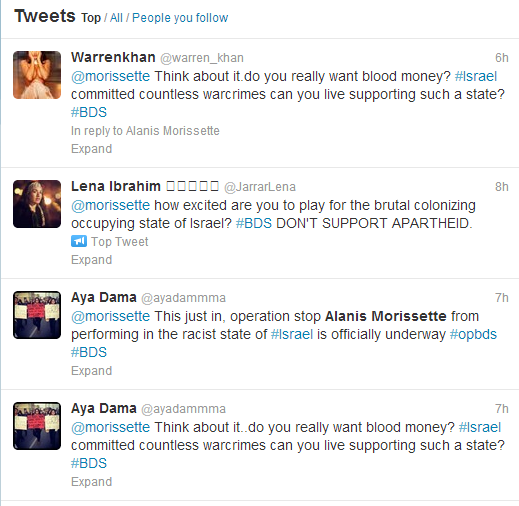 Maybe an education of the facts regarding the terrorist apartheid groups surrounding Israel is whats needed. Funny how they never mention any of the true apartheid regimes in the area. That just shows its all about racism. would you like me to make a list? do you have anywhere you could post it and ask ppl to replay?